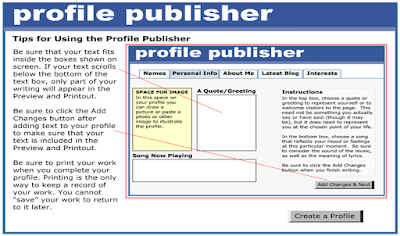 Profile Publisher is an excellent tool from ReadWriteThink. It allows students to create fake profiles on social networking websites and online newspapers and magazines. Students can use this tool for a wide variety of educational purposes including creating profiles for historical figures, or use it in digital storytelling projects to draft profiles for fictional characters. It an also be used ‘for profiles of nonhuman living creatures, inanimate objects or abstract concepts (e.g., profile of an amoeba, an historical monument, or friendship).’ Profile Publisher is similar to Fakebook Google Docs templates we reviewed last year and which enable students to design fake Facebook profiles. 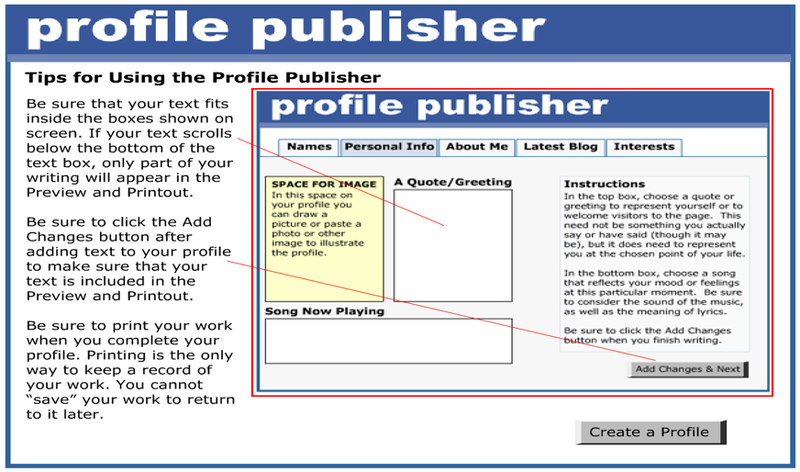 To start using Profile publisher, head over to this page and click on ‘get started’. Make sure you read the tips provided there then click on ‘create profile’. Choose which profile you want to make: personal profile or fictional character’s profile.Type in your info as required in the window that pops up then click on ‘Add changes and next’. You have to provide data for all the featured tabs before you can finally generate the final copy of your fake profile. The only way you can save your work is to print it out by clicking on the ‘print’ button.